JOEL HOUGHTON, OF OGDEN, NEW YORK. IMPROVEMENT IN MACHINES FOR WASHING TABLE FURNITURE. SPECIFICATION forming part of Letters Patent No. 7,365, dated May 14, 1850. Be it known that I, JOEL HOUGHTON, of Ogden in the county, of Monroe and State of New York, have invented a new and useful Machine for Cleaning Table Furniture; and I do hereby declare that the following is a full and exact description thereof, reference being had to the accompanying drawings, and to the letters of reference marked thereon. The nature of my invention consists in placing the crockery or other articles of table furniture in a machine fitted to receive them, and then to wash them, by turning a shaft with arms and buckets so arranged as to throw the water upon the crockery with force, and thus acting upon and cleansing each and every article. Inside the cylinder A B C D E F is a vertical shaft H, resting on the center in a socket on the bottom, and which passes up through and above the top or cover of the cylinder. Through the top of this shaft is a hole f, through which a pin is passed, by means of which I give it a rotary motion. Connected with this shaft is a cylindrical rack or crib g, and which is supported by the shaft. The diameter of the crib is so much less than that of the cylinder as to allow it to revolve freely within it. From near the middle of the shaft, also attached to it, are other wires i, which converge toward and are fastened to the lower and outer rim of the rack g. Their inclination from the center of the shaft downward and outward is about thirty degrees. On the bottom of the rack a hoop is placed on edge about midway between the shaft and the outer rim of the rack. The upper edge of this hoop is notched, so as to hold a plate or dish in place when put into the rack. The bottom of the cylinder A B C D E F being inclined toward the rim, in order to tend , the water in that direction, the machine is placed in a frame, so as to raise that end which is farthest from the wheel as that the top or cover of the cylinder will lie horizontal. In order to show the operation, I have substituted for the cover in the drawing a cross-piece K', to support the vertical shaft in position. Dishes and other articles of table furniture are placed within the rack g upon the conical rack i in any position in which they can empty themselves, and so that their surfaces will be exposed to the direction of the buckets b in the revolution of the rack. Boiling water is poured into the machine and the top put on. 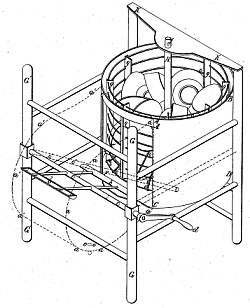 The rack or crib containing things to be washed is gently made to revolve by giving a rotary motion to be shaft H. At the same time the crank is turned when water is taken up by the buckets and thrown into the rack upon the surfaces of its contents, and this continued until they are thoroughly washed. After standing a few minutes they become dry, are taken out, and are ready for use without wiping and have a bright surface. When the horizontal shaft c is inclined, as c', the force of the water as thrown from the buckets will cause the rack g to revolve without other action on it. entire machine being arranged, combined, and operated substantially as is herein fully set forth.